So there are four Londons, one of which is closed off because magic took over and ruined the place. Kell can travel between worlds and he is a messenger for the royal Red London family. And also part of their family although he doesn’t always think so. 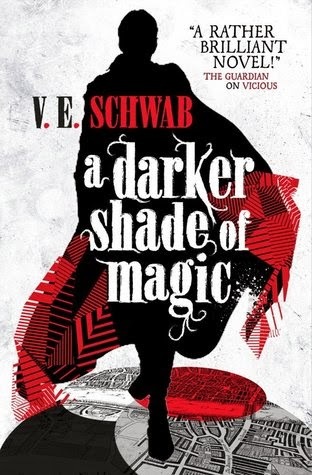 He gets tricked into taking half of a Black London Magical Stone to Red London and is attacked, but he escapes into Grey London where he meets Lila. Kell and Lila fight with Holland a bit before going to Red London together. Kell is caught and taken to Rhy, who is possessed by Astrid. Astrid makes Rhy stab himself and Rhy almost dies but IT’S OKAY BECAUSE KELL BINDS HIS SOUL TO RHY’S. *whispers* OTP. Kell and Lila go to White London and take out the Dane twins, and take back the other half of the BLMS. In the end, Kell still needs to go to Black London and Lila gets a pirate ship. Kell returns to Red London from his visit with Grey London’s king and prince regent. Kell works as a messenger between the three Londons (since Black London is off limits) and he delivers official letters from RL’s king and queen. He also illegally smuggles harmless items between the worlds – something that is considered treason so shhhh, don’t tell anyone. He returns to RL’s palace and it is revealed that Kell was pretty much adopted by the king and queen and grew up with them as a part of their family. But he still considers himself property. He also reveals that the first five years of his memories were removed by magic so he doesn’t know his birth name or where he came from. Prince Rhy is visited by Holland and given a necklace, although the guard isn’t entirely sure what Rhy and Holland were talking about. Holland removes the poor guard’s memory of the incident. Kell is sent to White London to see the Dane twins, who rule together and are hella creepy. Athos is busy torturing some boy when Kell arrives. Astrid and Athos drink Holland’s blood, and Holland can’t resist because he is bound to them and you can’t break a soul bond like that. Meanwhile, Lila (from Grey London) sets a boat on fire because the owner (her landlord) tries to force himself on her. She goes back to the tavern that she was at a year ago, which is owned by a man called Barron. Kell gets a bit drunk with the Dane twins and staggers back to the tavern in White London. A woman hands him a letter and a package just as he’s about to go back to RL. She asks him to deliver them to someone in Red London so Kell is like, eh, what’s the harm in that. Despite having promised Rhy that he would stop smuggling. Kell arrives at the address that the woman sent him to and is attacked by two cutthroats – killers for hire – who want the stone that was in the package. He kills one and disables the other. Kell then escapes to Grey London. In GL, Kell is robbed by Lila. He follows her back to the tavern and demands the stone back. Lila summons another Kell using the stone’s magic, and it’s all cool until other!Kell attacks her for trying to send him away. Kell manages to get rid of him and traps Lila to the wall before he leaves with the stone. Holland finds Lila near the tavern and tortures her in an attempt to get Kell to come to her. There’s a fight, and eventually Kell and Lila get away. Kell and Lila take supplies from the tavern because Lila has convinced Kell to take her with him on a parallel universe roadtrip. Kell needs to get the stone back to Black London, where it came from, and Lila wants adventure. The pair get split up in Red London, their first stop, but eventually Kell finds Lila. They travel to the Red London version of the tavern only to find that it has been burned down. Holland kills Barron because he didn’t know where Kell and Lila went. He then travels to RL, shows up at the tavern, and tries to torment Kell and Lila to come out of hiding. Kell uses the stone to cloak himself and Lila. This makes them corporeal so Holland thinks they’re not there. Lila finds out that Barron is dead and gets very upset. Lila and Kell use the stone to cloak them while they go to Fletcher’s shop to get a chess piece which will act as a talisman to get them to White London. Turns out that using the stone too much is affecting Kell and so Lila takes it. Fletcher turns Kell into the royal guard, who show up shortly after Fletcher alerts them. Lila cloaks herself but Kell is taken away and then knocked out. One of the guards stays behind and slits Fletcher’s throat. Lila grabs the chess piece and then goes off to save Kell. Kell is taken to see Prince Rhy, except it’s not really Rhy – it’s Astrid Dane from WL possessing his body using the necklace that Holland gave to him. Lila shows up and helps Kell out, and Astrid makes Rhy STAB HIMSELF NOOOO before coming out of his body and fleeing. A drunk guy called Booth has been possessed and is going around spreading the Black London Magic Virus in RL. Kell and Lila get to White London and go to the Dane’s fortress. They split up. Kell is confronted by Athos and the two fight. Lila kills the tortured boy who is supposed to be guarding the door but he just wants to die in order to be released from his bonds. Lila finds Astrid in the throne room and attempts to kill her but is unable to. Astrid wakes up and fights with Lila. Lila gets knocked down and Astrid goes to help her brother out with the Kell situation. It’s a bit late though, because Kell has already killed Athos. Astrid pretends to be Lila but Kell sees right through her disguise and kills her in a moment that is very THIS IS FOR MY FAMILY /Anastasia. Kell and Lila return to Red London and to Rhy. They still haven’t taken the stone back but at least they have both halves of it now. Rhy and Kell flirt a little bit and I’m pretty sure they confess their love off-screen. Lila gets a ship because she’s a real pirate now. Thanks for the great review/summary. On to A Gathering of Shadows! Yes! But Holland wasn’t actually dead when Kell sent him to Black London with the stone. You left out the part where Holland stops Kell from going to white london near the end and they fight until Kell wins. You also said they didn’t send the stone back but they did send it to black london with Hollands body.